Recently I have seen two ads which have made me cross. The first one I encountered some weeks back, over my breakfast while perusing the Irish Times (one of my most cherished times of day). Turning the page my eye was caught by an ad for Harvey Nichols which featured a woman who had quite clearly wet her pants. Yep, Harvey Nichols was appealing to women to come and visit their sale where we may wet ourselves with excitement! A woman who had supposedly pee’d her pants is not the image I expect to see in my Irish Times of a morning. Most off putting of one’s breakfast. The bad taste of the ad was staggering. I don’t shop in Harvey Nicks (and I don’t generally pee myself with excitement about shopping generally) but are they not considered a high end store? What was being said in this ad? Is it now socially acceptable to pee your pants? I was annoyed and stunned. You can therefore imagine how doubly stunned I was the following day when the scene repeated itself almost exactly – breakfast, Irish Times, Harvey Nichols ad – but this time it featured a male model – and he had no wet stain on his pants! Dry as a whistle he was. Now I was really mad. So, Harvey Nichols thinks only women pee themselves with excitement. However some chat about it all on twitter indicated that the same ad had appeared in a different newspaper a few days earlier and the male model had a wet patch. 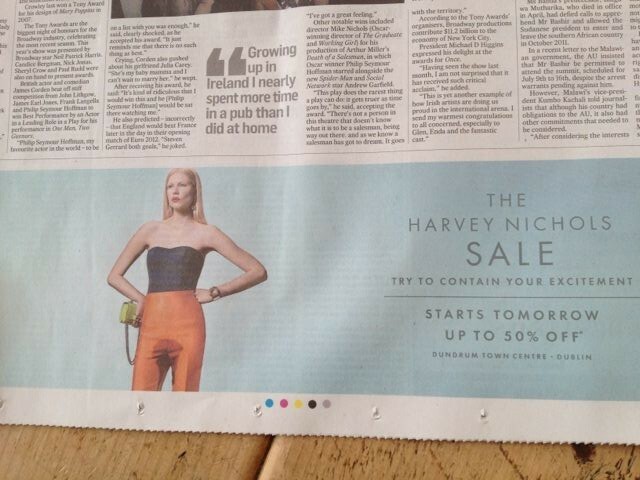 Had the Irish Times called a halt on the peeing models? All I can say is ‘yuck’. Today Twitter brings to my attention a flyer that Centra are apparently distributing which is advertising a range of their ‘special offers’ under the banner ‘Children’s Allowance Day Deals’. All kinds of products are advertised including a box of beer? It was not just me who was annoyed. Twitter was alive with comment – which as far as I could see was all negative. I cannot believe that both companies were so blind to their marketing guru’s line in patter that they could not see the poor taste and lack of judgement evident in both of these very different ads. And both ads are clearly aimed at different target markets. I would be fascinated to know the truth. Either way I don’t agree with the ‘all publicity is good publicity’ philosophy. I would be terrified to shop in Harvey Nichols – imagine trying on a pair of trousers that someone may have gotten over excited in? Nah. Thanks. I hadn't seen those ads but they are bizarre! And we all think “Mad Men” is in the past. Even Don Draper wouldn't get away with that!